Four more former world indoor singles champions threw their hat into the ring when they claimed their second round places after some tough exchanges today. Three matches were decided 2-0 in a tie break, with only Nick Brett winning in straight sets. 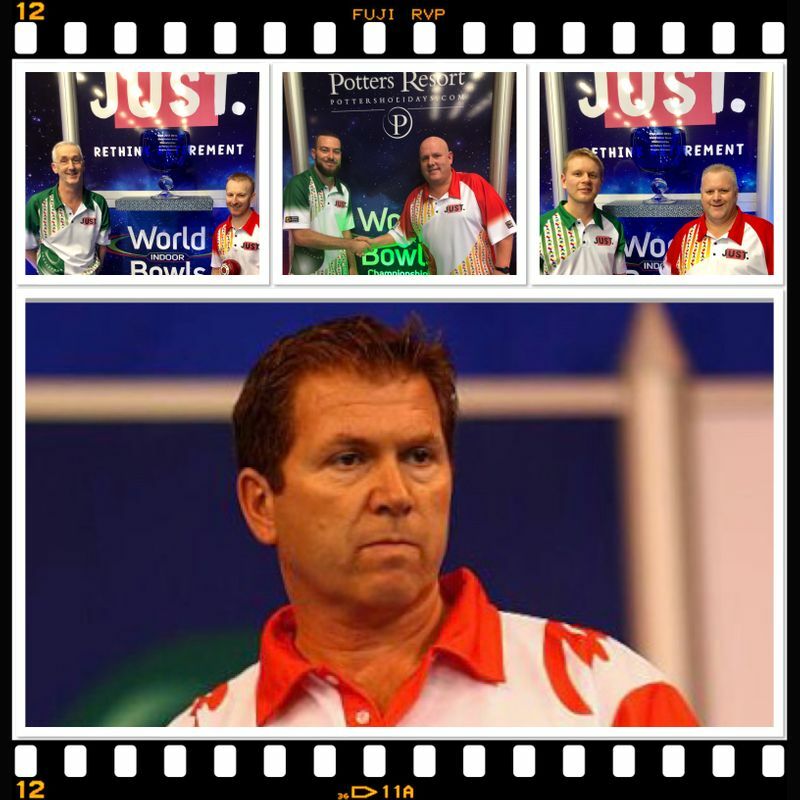 TEN of the thirty two players who came under starting orders have taken out this title before – Scots Stewart Anderson and Paul Foster MBE who have already successfully addressed the first round hurdle while holder Mark Dawes gets his show on the road on Monday night and only David Gourlay bowing out. However SIX champions are in the bottom half of the draw and earlier today Mervyn King (2006), Darren Burnett (2014) and Nick Brett (2016) and Alex Marshall who last won this title for a record extending sixth time in 2015, all furthered their cause. Andy Thomson is a three time winner and Greg Harlow (2010) are both eagerly waiting to get their campaigns up and running this week-end. Today though local Norfolk hero King had to pull out all the stops in his match against 31 year Dolphin Qualifer Shaun Jones. He cruised to the opening set 12-2 in just seven ends but in the second set Jones showed that he wasn’t at Potters just to make up the numbers. He went 5-0 ahead and eventually won 8-3, before disappointingly losing 2-0 in the tie break. The first match of the afternoon session was a game of two halves, where Darren Burnett, a community police officer from Angus, was left reeling on the ropes, finding himself 8-0 down after five end as Scottish qualifier Andy Barker produced some sensational bowls and went on to take the first set 9-6. Burnett though had begun to find his touch in the closing stages of the first set and he kept that momentum going in the second set, only dropping one end, winning the set 8-3, and then the tie break 2-0. “To be honest, I couldn’t get a feel for anything in the first set. I was on a slippery slope but gradually it all came together. Andy was brilliant in the first set and I eventually turned up as the match progressed, so I was just delighted to find some form and get a win under my belt” said Burnett. Andy Squire, who had qualified as the winner of the Preliminary Playoff event the previous week, provided the opposition for Nick Brett but despite giving a good account of himself, bowed out 9-3, 6-4. In the last head to head of the day, 28 year old New Zealand qualifier Ray Martin faced the might of bowling legend Alex Marshall in a match that produced some heart stopping moments. Marshall, as expected dominated in the first set winning 11-2 but Martin proved what a fighter he is, playing some game changing shots in the second to win 8-7. However in the ensuing tie break Marshall’s experience paid off as he won 2-0. This World Matchplay Mixed Pairs takes centre stage today with a cracking opening game between holders Lesley Doig from Scotland and England’s Jamie Chestney against Ladies singles champion Katherine Rednall and her partner Greg Harlow. **NB Schedule of Play for Friday, Saturday & Sunday is attached.